by Talen on April 25, 2011 in Thai Language 27 Comments - Leave a comment! I can’t live without my iPod Touch,it’s the one piece of gear I own that is completely indispensable. It carries over 4000 songs. notes on various trips and posts I am working on, it can connect me to the internet in a pinch and it can use Apple Apps. Many of the Apps make life easier but none compare to the Talking Thai–English–Thai Dictionary App from Paiboon Publishing. I was first introduced to the Thai–English–Thai Dictionary from Benjawan Poomsan Becker in paperback form which I purchased before my first trip to Thailand. While the small pocket edition book has served me well over the years it has nothing on the iPhone App which boasts over 100,000 entries with a further 30,000 entries being introduced in an upgrade to be released later this year. People will love our new upgrade. There will be at least 30,000 more useful words, including medical, legal and other technical terms. We are also adding lots of new slang, internet/Facebook/chat terminology. I will start recording the new words in June. I will tell you more later when we are ready to launch it around October. People who buy it now will get a life time free upgrade at this price. The Beauty of the Talking Thai–English–Thai Dictionary is the multitude of ways in which it can be used. You can search for words in English, Thai script or my favorite Thai sound. There are often times when I am in a conversation and a Thai word is used that I haven’t heard before And I don’t know enough Thai script to look it up, type in the word as it sounds and the majority of the time the dictionary finds what I’m looking for in an instant. Other times my ears are way off. Another great feature of the Thai–English–Thai Dictionary is the clear precise sound recordings that accompany each word. There is no doubt as to how the word is pronounced as it is spoken by a native speaker, Benjawan herself, and the dictionary has over 14 hours of professional sound recordings. This has become the go to app for me, when it comes to Thai language Apps nothing else can compare. The Talking Thai–English–Thai Dictionary iPhone App is a bit expensive with a price tag of $24.99 but it is well worth the price when you see all the cool stuff packed into the app and the knowledge that when you buy the Talking Thai–English–Thai Dictionary iPhone App at this price it will be upgraded free for life. A much more comprehensive look at the software behind the Talking Thai–English–Thai Dictionary Can be found on Women Learning Thai and Some Men Too in the post entitled: Review: Three-Way Talking Thai Dictionary: Mac and PC. Also you can get more details from Word in Hand and Paiboon Publishing at Talking Thai–English–Thai Dictionary. Just recently Paiboon Publishing along with Word in Hand have become sponsors of Thailand, Land of Smiles and Benjawan graciously gave me 3 copies of the Talking Thai–English–Thai Dictionary app for the iPhone, iPad and iPod Touch to give away to my readers. Contest rules are very simple, all you have to do is comment on this post and on Sunday May 1st, 2011 I will pick 3 winners to receive the 3 free download coupons. You have nothing to lose and everything to gain with this great Thai software. Disclaimer: This review of the Talking Thai–English–Thai Dictionary iPhone App is my honest opinion and I am not being paid for this review, nor am I an affiliate of Paiboon Publishing or Word in Hand. I’m sooo excited to read about the new Talking Thai–English–Thai Dictionary Iphone application! I started learning Thai 15 years ago from my Thai friends, then I got a Thai friend to record her readings of all the Thai words at the back of the Lonely Planet Thailand travel book and played the tape over and over again! Next, I purchase the Lonely Planet Thai phrase book with CD. Eventually, I signed up for the Thai language classes from the YMCA. I’m back in Malaysia after several years in Texas, and ready to get back into my Thai language lessons. This Iphone application is the next best thing I can get for myself! Its really hard to learn Thai when there really isn’t anyone here who can speak Thai with me. I can wait to use the Iphone application to perfect my pronounciation of Thai words for my next trip to Thailand. I hope being the first to comment would earn me brownie points with you? KittyKat, Being first earns no brownie points but you’ll have the same chance to win as everyone else…Godd Luck! Excellent! Whoever wins the copies are just going to love the versatility of Chris and Benjawan’s Talking dictionary. Cat, So true…I love this app so much and use it constantly and knowing that they will be upgrading it soon is a big plus. I’d like to enter for a chance at the prize. Sounds like a REALLY COOL app to use on my Ipod touch and would definitely make living in Thailand A LOT easier! Great to see your review of this amazing application here, Talen. After a 10-month love/hate relationship with an Android phone (more hate than love, btw), I converted back to the iPhone. Having read some very good reviews of this application, I purchased it as soon as my phone finished booting. And I have been in love with it ever since. Although it is one of the more expensive applications out there, I consider it worth every cent. No other app I’ve downloaded even comes close in usefulness for learners of the Thai language. i would like to win the software, then i would have to buy some apple gadget, just have a palm now, which has the old version of the dictionary, that did not speak, but gave up my paper dictionaries once i started to use the palm version, maybe not totally for the better, as am rusty on how to use the paper dictionary now…. I have using the non talking palm version for years and the talking part is a big plus! Looks like a really great app – thanks for your review! This sounds like the app to have. I’m excited to get it whether it be by chance or by my me opening my wallet!!! This app is my favorite — looking forward to the upgrade! App sounds great, we’ve just moved to Bangkok for a year so this sounds perfect! This is handy. I have tried several Thai – Eng apps but always have problem reading words in Thai because most of the time they don’t romanized the word written in Thai. Looks incredible! And would be great for my time living here! I would love to win this app……..thanks so much for giving 3 away! 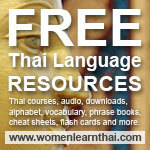 I am just starting to seriously study Thai and I think this app would be indispensable. Thank you so much for your review and the opportunity to win a copy! Paiboon Publishing has great products and Benjawan always does a great job! You can read her autobiography now too, available on Amazon. I would love to tell you how good this Talking Thai–English–Thai Dictionary App is in Thai but I can’t yet as I don’t have it. I am learning though, slowly. A great write-up and a marvellous giveaway prize which unfortunately I’ll have to miss out on because I don’t have the necessary platform to run it on. Though having read your post I’m getting very interested in an iPod Touch. I just might have a wander into town today and take a look at one. Martyn, I’m not big on all the Apple iPhone and iPad and hype but the iPod touch is just the best gadget ever invented …if you love music and have a need for things such as the Talking Thai dictionary App then it pays for itself very quickly. I need help , where can I down load the app?